Yesterday morning I took advantage of the last of the strawberry picking season. 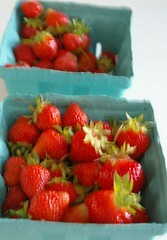 I went to a farm close by and picked a little over a pound of strawberries. We’ll be enjoying them over the long weekend! Yum! The perfect summer treat.